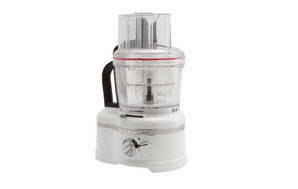 Snapshot: The KitchenAid KFP1644 Food Processor has 2 speeds and a storage box for attachments. How does it rate? Excellent results in our carrot-slicing, pastry-kneading, breadcrumb-chopping and mayonnaise-emulsifying tests. Very good results in our cheese-grating test. Comes with 2 processing bowls. Parts are dishwasher safe (top-shelf only). Not very stable on bench during operation. Can jolt and move when mixing a heavy load.